What if Republican presidential candidates were e-readers? 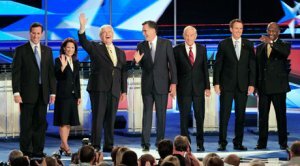 I saw a funny comparison of CSR reports to celebrities and it got me the idea of comparing the 2012 Republican presidential candidates to e-readers and see if we can find any interesting (and funny) matching and identical characteristics. So without further ado, here's our comparison. We hope you'll enjoy it. Why? "Expert recommendations and fun social features"
Why? Believes it brings added-value to the field. Bit of too much self-esteem. Why? An old-timer. Doesn't really have a chance against the new generation. Why? Have you ever heard about it? I guess not..
Why? Ignored by the media. Why? Front runner. Yet, you always look for something better.